Our Ms. Amazing has found us :) We have a surrogate!!!!! Words simply cannot describe the emotions running through my bones at the moment. I have never been so in awe of someone in my entire life. To offer the gift of life for someone else, and cherish and take care of that life until when we can take over is nothing but miraculous. A very spiritual man from India recently gave me some advice. It was a time where I wondered if I should give up. It was a time where I wasn’t entirely sure I had enough left in the tank to continue on with such an emotional and difficult journey. With every high came twenty lows and with it the wonder of whether I could continue on this path. His wise words encouraged me on and it is the reason I am now where I am today. “Never let the flame of hope go out. With hope in your life, no matter how bad things may be, Peace, Faith and Love may shine brightly once again”. With this was the image of a candle of hope. 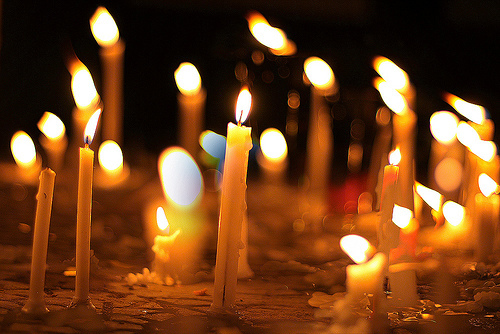 Over the past 6 months, I have hung closely to that single flame of hope – refusing to let it go out. Even when things seemed to be at the depths of despair and all doors were closed, I refused to let that flame dissipate – though at times it was weary! When I first began speaking with this amazing lady, I daren’t get my hopes up. But I nevertheless enjoyed our conversations and we had a lot in common. We ended up speaking about everything under the sun for several weeks and I genuinely felt a special connection with her. People have spoken about speaking to potential surrogates as “surrogate dating” and it always made me giggle. At the end of a few weeks it occurred to me that, well…if this was a date – I would be really happy :). Again, not wanting to get my hopes up, I continued to just chat with her as I do with all my other friends and put the thought of surrogacy out of my mind. And I am so glad I did!! It was because of this, that she was able to see the real me. I didn’t even know at the time as I was being my usual self and it was this that convinced her that there was something here and I was the possible Intended Parent (IP) for her. She sent me a message that I will never ever forget and will cherish always as it means more to me than anything. She had told me that it was my constant support of her through a medical procedure she was having that gave her the real idea of who I was. The fact that she wanted to go ahead was not my blog, not my story, not my illness, not Jamelia’s desire to have sibling but her connection with me and who I am as a person :). This humbles me and makes me feel so wonderful. She chose me because of ME and that we got along so well. Yay!! It makes for a wonderful and amazing future for all of us, and I truly will consider her like a sister for the remainder of my life. After thanking her partner for lending me her body for 9 or so months, he responded with – its all good….as long as she comes back in near new condition!. My candle of hope is far from extinguished! It is burning brightly and beginning to relight faith, love and peace. And thank you Kate for your auspicious gift – I think it worked!! Hold on to your britches people….let the fun and happiness begin!!!! Spending the morning studying, though difficult with my mind on other things. I decided to take a coffee break and walk down the driveway to check the mail. I was hoping for a cheque from Medicare, but what I found was far more valuable than any amount of money. I rarely receive gifts or packages unless it is from the university book shop or something I have purchased online – both of which are only few times a year. So to find a neat little unexpected package sitting there in my mail box was exciting in it itself! It was from my lovely sweet friend who recently travelled to India to commence her surrogacy journey. Her auspicious gift has lifted my spirits and provided a level of excitement to continue on. In this lovely little package of hope was an Indian fertility egg which represents new life, new beginnings, fertility and hope. 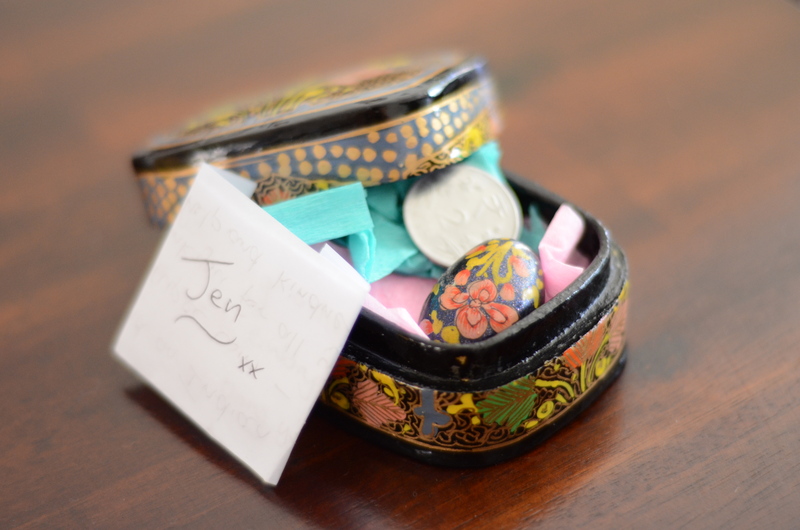 This little gift all the way from India, in a sweet little trinket box is simply perfect. The lucky Indian rupee also signifies luck. To hold a lucky Indian rupee increases your chances of luck, and winning what it is that you dream of. 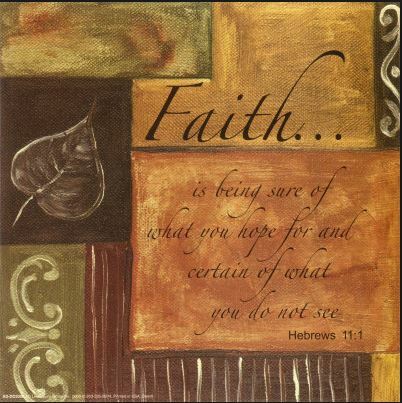 To me, it is even something deeper than this…not only faith in another, but faith in oneself. Each day things occur which sometimes make you question faith to varying levels. Faith in your ability, faith in your judgement and faith in the universe. Beyond all of this however is the unknown. So many Intended Parents (IP’s) have to have faith in abundance. Faith that like a trickling water feature, it is overflowing and never ending. A knowing that all will be OK. That OK may not be the OK that we intend – but faith that whatever is meant to be will be. A dear friend of mine, and I can call her this even though we have not met as we have shared our deepest darkest fears, our all inspiring courage and a determination to give it our all…..in otherwords – we have declared to have faith in the unknown. It is a beautiful thing. This dear friend has recently returned from New Delhi India. Her surrogacy journey has taken her to this colourful, vibrant and exciting country to fulfill her dream (or so we hope). Her family including their 4 year old son spent a month in India meeting her surrogate, undergoing IVF and transferring her cherished embryo’s to this wonderful Indian lady who agreed to carry her child.For people not familiar with the surrogacy world, this might sound crazy! It may appear that faith has leaned a little too far into risk. However more Australian babies are born through surrogacy in India and Thailand every year than in our own country! We have the surrogacy bureaucracy in Australia to thank for that. But nevertheless, hundreds of Australian babies are being happily born through surrogacy in India and Thailand and coming home to Australia each year. My lovely friend has been patiently waiting to hear the news of her pregnancy. Today is the end of the dreaded two week wait (2WW) from transfer to pregnancy test. Her family have been amazing, and her family has vowed to not give up and will help and support them emotionally and in any way possible to try again if today’s news isn’t as hoped. We started this journey many months ago together. We have talked on the phone many times, shared our fears and hopes, and I am excited beyond belief that she is already at this point of finding out if they are pregnant. There could be a Christmas baby!! So with this excitement, and seeing so many IP’s around me moving forward in their journey, I am excited too. And I realise that faith is what brings us to this point. Faith in the unknown, faith in the universe, faith in doctors, faith in something which there is no guarantee will happen and faith that if it doesn’t happen, life will move on, and we will cherish it with all our might. I am not giving the baby up!